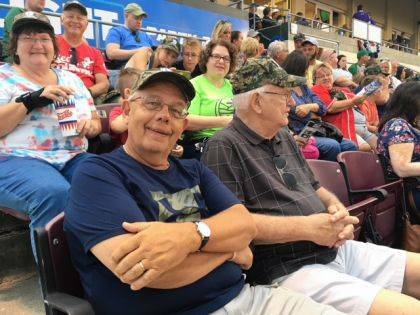 A capped and smiling Ed Hardin, front center, recruited 41 baseball fans from the Urbana Church of the Epiphany and the Mechanicsburg Church of Our Saviour for an evening of fun at a Dayton Dragons game at Fifth Third Field. Next to Hardin is Ron McFarland and in the row above are, from left, Cathy Murray, Isaac Waddell and Angela Murray. Seated in the top row are Todd, Sophie and Will Boeck. Sounds like a biblical narrative, but the Christians of this story are 21st century Episcopalians, families and individuals aged 8 to 80, from the Church of Epiphany in Urbana and the Church of Our Saviour in Mechanicsburg. On a perfect August evening they filled 41 seats in a section behind first base at Fifth Third Field, Dayton, and watched the Dayton Dragons beat the Bowling Green (Kentucky) Hot Rods 3-1. The baseball outing was the idea of Ed Hardin of Epiphany. He spotted the Aug. 18 special $10 ticket price and surveyed the two congregations for interest. Twenty-eight folks signed on immediately and Ed announced, “the game’s afoot” (apologies to Arthur Conan Doyle). Before game time, another 13 people bought the $10 tickets, which guaranteed a reserved seat and a Dragon’s baseball cap. Popcorn, peanuts and soft drinks made the traditional summer pastime fully authentic with the Dragons’ 3-1win a satisfying bonus. At church the following day, the still-spirited participants agreed that it will be hard to top this Cluster venture, but Ed said other intriguing possibilities are already being considered. Many of the Cluster events and outreach endeavors have been Ed’s suggestion, e.g., an Easter egg hunt, Christmas crafts and games and several swimming parties each year for community families. Epiphany and Our Saviour constitute the Northern Miami Valley Episcopal Cluster (NMVEC), served by Priest-in-Charge Rev. Donald Duford. The parishes function independently but come together for special worship services, outreach ministries and gatherings of families and friends to expand and unify the faith community and strengthen esprit de corps. Submitted by Sally Johnson on behalf of the Northern Miami Valley Episcopal Cluster.